Keep records for all taxable highway vehicles registered in your name for at least 3 years after the date the tax is due or paid, whichever is later. They must be available at all times for inspection by the IRS. Also keep copies of all returns and schedule 1s you have filed. Keep your records even if a vehicle is registered in your name for only a portion of a period. If the tax is suspended on a highway motor vehicle for a period because its use on public highways during the period did not exceed 5,000 miles (7,500 miles for agricultural vehicles), the registrant must keep the records at least 3 years after the end of the period to which the suspension applies. 1. A detailed description of the vehicle, including the VIN. 2. The weight of loads carried by the vehicle in the same form as required by any state in which the vehicle is registered or required to be registered. 3. The date you acquired the vehicle and the name and address of the person from whom you acquired it. 4. 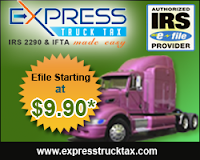 The first month of each period in which a taxable use occurred and any prior month in which the vehicle was used in the period while registered in your name, with proof that the prior use was not a taxable use. 5. The date the vehicle was sold or transferred and the name and address of the purchaser or transferee. If it was not sold, the records must show how and when you disposed of it. 6. If the tax is suspended for a vehicle, keep a record of actual highway mileage. For an agricultural vehicle, keep accurate records of the number of miles it is driven on a farm. 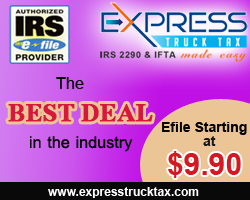 When you E-File your Form 2290 using an IRS Authorized E-File Provider like ExpressTruckTax.com, all your records are stored in your online account. If your records are ever requested by the IRS, you can simply sign into your account and download the requested records. 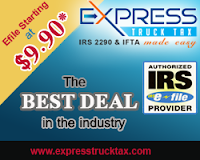 In addition to having your records right there at your fingertips, through ExpressTruckTax.com, you can file your Form 2290, pay your HVUT taxes owed to the IRS and receive your Stamped Schedule 1 within minutes. 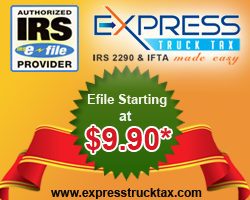 Having the option to E-File makes the annual filing process quick and easy and simplifies the recordkeeping requirements.